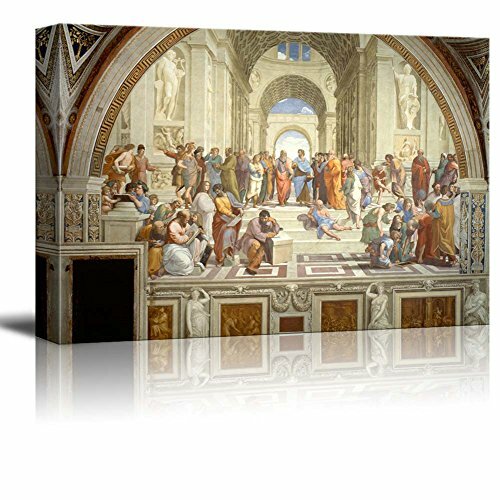 wall26 The School of Athens by Raphael Giclee Canvas Prints Wrapped Gallery Wall Art | Stretched and Framed Ready to Hang - 16" x 24"
Quite happy to have a reproduction of this significant art. The quality is very good. For the size I ordered it fits well in the part of the house that I chose. And thanks to Amazon the item was delivered "free" and in good order. This is a beautiful print. I do wish I would have ordered 36x24 instead of 24x18. I still might order another one and put the smaller one in my classroom at school. Stretched perfectly and great detail. I included a couple photos, including one with a framed 24x36 next to it so you can compare what 18x24 looks like. Re "The School of Athens..".It just could not be better. I like it because it reminds me of my thought process.